RetailDesk is by far much better than typical Cash registers. Cash registers do not offer scalability and they do not grow with your business. At some time, they become bottle neck for your business; this is where RetailDesk helps you grow your business. RetailDesk is much more reliable and on the same way affordable retail solution. Inputting all the items you sell can get too complicated as well. The number of buttons in a cash register is limited which is going to force you to use different combinations of buttons in order to account for all the products you sell. Well, this is very time consuming to start with, besides that you have to make a list of all your products and their corresponding combinations. It will also consume more of your time and your employees to memorize all this or you have to look at that list every time you are ringing up a customer. A touch screen monitor with your menu on it sounds a better alternative by now, don’t you think so? • What tax must your business collect on a sale? • How many departments are in your store? • How many products do you carry now? • How many in the future? • How busy will your store be? • Will you need more than one register? • How will your clerks process refunds? Reports are very important to managing your business; cash register reports are very outdated and not very useful because they only show you your total sales and maybe the breakdown of that total. Well, if you think it’s time to switch from your old fashioned cash register to a more modern Point of sale system that can help you better manager your operations, save you time and money, and enable your business to grow. 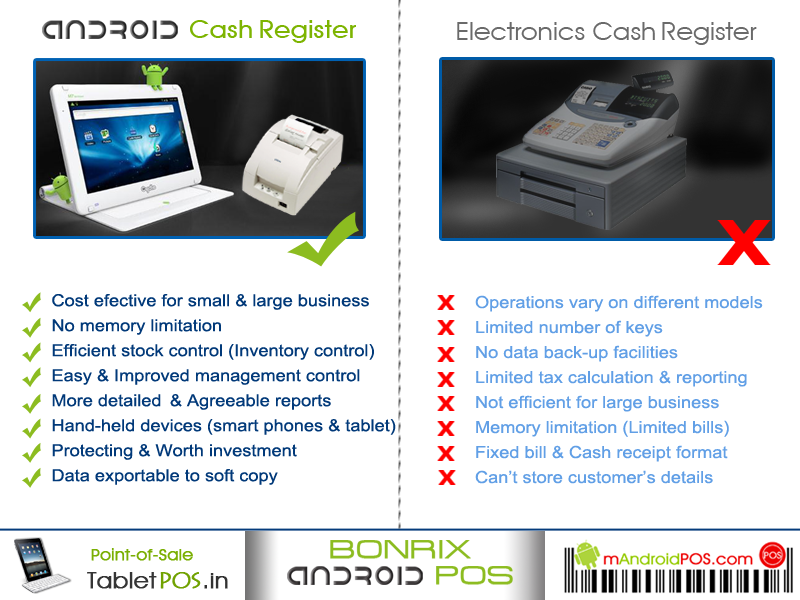 RetailDesk is an innovative Point of sale product by Bonrix Software Systems. It is a one stop POS solution comprising of state of the art features which are must in any POS product. A-801, Samudra Complex, Near Klassic Gold Hotel, Off C.G.Road, Ahmedabad-380009, Gujarat, India.